Windows 8 is beginning to embed itself into the public knowledge and we're getting more and more used to the concept of touchscreen laptops. And that's the exact where the affordable, sub-£500 Samsung ATIV Book 9 Lite fits in. Its name might sound like a bit of a mouthful, and the unwarranted all-caps "ATIV" brand was apparently conceived by taking the Latin word for life - vita - and spelling it backwards. Um, that makes no sense at all. Does that represent death for the latest Samsung laptop, or does the new series bring fresh lift to the Korean manufacturer's line? The ATIV Book 9 Lite does away with the old Series 3, 5, 7 and 9 models with a fresh lease of life. It's all new. This 13.3-inch laptop might not be made up of the supreme build quality that you'd find in pricier laptops, but we're still fairly fond of the way the Book 9 Lite looks. The outer shell is a glossy midnight blue finish, with some visual texture that you'll only catch a glimpse of if it catches the light in the right way. Lift the lid and you're presented with a smooth, matte surface containing a full island-style keyboard and trackpad to the front. Above is the 13.3-inch screen which continues the glossy route. Indoors and in the progressively darker UK nights we've not found this to be a problem, but in brighter light - including overhead spots, as we've found - it proves to be a little too reflective. The panel is an LED display, not an IPS panel, so the viewing angles won't always give the most contrast view to the eye, but we've found the usable angle of view to be very wide. Resolution is a little on the low side at 1366 x 768 pixels, however, which is a bit of a letdown - but not to the point of being bothersome for browsing and all those usual tasks. At greater-than-720p it's still ample enough for watching movies with top and bottom letterbox blackout. The plasticky finish leaves us feeling a little cold on the one hand, but on the other it's part of the reason that this slim package is lightweight. It's just over 1.5kgs, which is fairly standard in this category. Something a bit pricier like the Lenovo Yoga 13 weighs in at around the same. But as we've nodded to, the Samsung is a slender slab of AMD-powered machine. Closed up and it's just over 1.7cms tall - more short, really - the design carves a near optical illusion taper by the way it pinches in away from the thickest point to look extra thin when viewed from the side. Lined up across the two sides are a variety of ports: USB 3.0, USB 2.0, micro HDMI, mini VGA, 3.5mm headphone jack, mini Ethernet, and an SD card reader tucked away under a plastic flap. All bases covered then, although for practicality's sake you will need adaptors to use some of the mini ports with success. As with many Windows 8 machines the ATIV Book 9 Lite adopts a touchscreen principle. You can swipe in, drag icons around and do all those touch-enabled things that you may - or may not - want to do. We're still on the fence about touchscreen laptops, but get that some users will want to dirty-up their screens with their fingertips. But you don't have to touch the screen, that's part of the pleasure of using a laptop. And the island keyboard found in the 9 Lite feels really good in use. It's springy and resistive to just the right point and there's enough separation between keys for it to not prove a mash-up of keys when typing. We've been using it as our go-to machine during the testing period and found our typing was unhinged, despite dropping down from a 15.4-inch to the smaller-scale Samsung. The trackpad, too, has just the right amount of finger-grabbing tactile feel to its finish for a fluid experience. It's easy to fling the cursor around screen, use it for two-finger gestures to scroll up, down or across documents, and the unmarked left and right click positions come naturally in use. All in all, and considering the price point, we have very few qualms about the ATIV Book 9 Lite in use. It might be a bit plasticky, but that's to be expected, and it doesn't detrimentally impact the device experience. Under the hood of the Book 9 Lite is a quad-core AMD processor, paired up with AMD Radeon graphics and 4GB of RAM. It might not be Intel, and the "up to 1.4Ghz" might lack the more serious thump that you might hope for, but then this is the "Lite" version of the ATIV model. It's in line with what we expected. We've been browsing, typing, watching movies and doing all that normal day-to-day computer stuff and seen little to no issues with the performance. The 128GB SSD drive on board makes light work of load times - wake from sleep is near instantaneous. Once switched on we also found that so-called "bloatware" is kept to a minimum. Norton Internet Security is loaded up by default we didn't find it to continually prompt us to do anything - a rare but good thing. Other than that we had one Samsung own-brand prompt on which we ticked the "don't show me this again" box and that was that. However, if you want to step things up a gear for serious photo editing then this isn't the laptop for you. It can chug through things, but not at smooth frame rates or at pace. At less than £500 we're not surprised: go up the pricing food chain and you'll be able to access more power. One of the benefits of this AMD chip set is its apparent low impact on battery life. We've been getting six hours from the device without problem but then we've not been stretching its processing capacity in our day-to-day work. Dim the screen, go extra light and we reckon the Lite will last out considerably longer still - up to a claimed nine hours. But still, in this class the battery performance we've been seeing is more than acceptable. Some upcoming Intel Baytrail machines might see that bettered by some margin, but for the time being we're content with the life per charge from this ATIV. 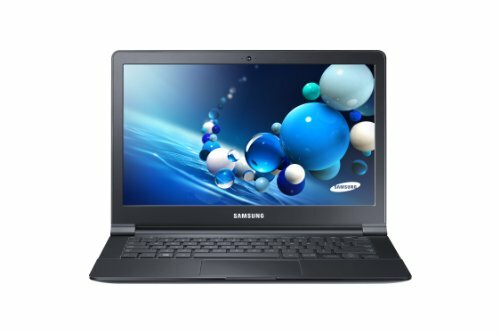 The first ATIV model that we've seen for review breathes fresh life into the Samsung laptop range. The Book 9 Lite is a good looking, albeit fairly plasticky, 13.3-inch offering that's affordable and just as on the money when it comes to all those day-to-day tasks. The SSD makes it fast to load and wake from sleep, and even if the AMD processor isn't cut out for gaming or hardened editing, we're not surprised - that's not what this machine is all about. A comfortable typing, tracking and touchscreen experience wrapped up in a portable package. Even if the ATIV Book 9 Lite doesn't quite take our breath away in terms of excitement, for the money it's one of the more favourable laptops out there today. Well worth a look.